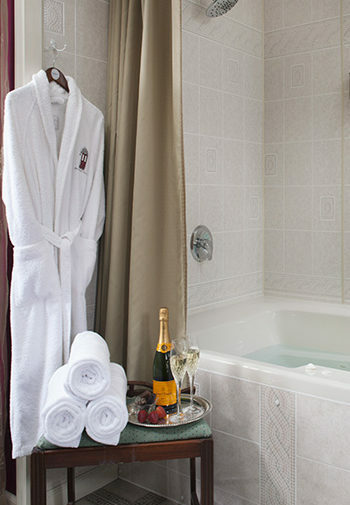 Providing the perfect setting for a romantic getaway near Harrisburg, the Ewing Room at Carlisle House Bed and Breakfast boasts a king-size bed, private bathroom, and in-room double whirlpool bath with dual showerheads. Named for the long time owners of the Carlisle House, the Ewings have been a part of Carlisle history since 1853. William and Jessie Ewing purchased the home in 1927. As the original 1st-floor front parlor, a remarkable feature of the room is the Ben Franklin type fireplace insert, which warmed the home much more efficiently than just the fireplace. 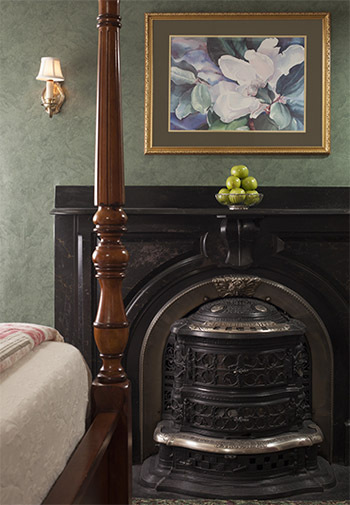 This stove, which is now just ornamental, the marbleized slate mantle, 11-foot ceilings with both crown and chair moldings lend an appropriate period touch to the decor of this dramatic room. For your comfort, this front room has been equipped with a burl wood four-poster king bed, work desk with Ethernet and wireless Internet connections. A double in-room whirlpool bath with twin showers offers you enjoyment by the light of the early 1930s pewter chandelier, and an en-suite half bath completes the room.